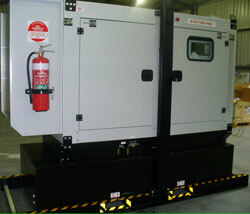 Wet Earth offers are range of premium quality Australian made diesel generators. All generators are built to order (typically 3 weeks) and can be customise to suit your requirements. The generators use diesel motors by Yanmar (Japan), JCB (UK) and Caterpillar (US) which are all well recognised and supported in Australia. We can also use engines from other manufacturers including Hino (Japan), Kubota (Japan), Isuzu (Japan), John Deere (US) and Perkins (US) on request. The canopy generators use premium quality Italian made galvanised and powder coated steel noise attenuated (60-68dB at 7m) canopies. To give an idea of options and pricing we have included some of the more popular generator configurations in the categories below. If you would like us to quote on a generator then please email us the details of your requirement including electrical load (eg 55kW submersible pump) and any specific requirements (eg standard mine spec with centre lift) and we will design a generator for you. For generators larger than 130kVA, DC generators, or custom solutions please call us on 02 6062 3300 or send an email to sales@wetearth.com.au. Below are some of our more popular Diesel Power AC Electric Generators.